Super Mario Kart is a go-kart racing game developed by Nintendo EAD for the Super Nintendo Entertainment System (SNES). 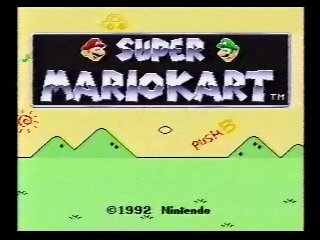 The first game of the Mario Kart series, it was launched in North America on September 1, 1992. Selling eight million copies worldwide, the game went on to become the third best selling SNES game of all time. This is the first game to pit NES mascots like Donkey Kong, Mario, and Bowser against each other in a race to the finish. Category Note: Lakitu skips, deep water skips, and wall glitches are considered a separate category because they skip large portions of courses. Best Mushroom Cup time: 0:05:34.69 by Jeremy 'DK28' Doll on 2009-02-22. Best Flower Cup time: 0:06:40.00 by Jeremy 'DK28' Doll on 2009-02-22. Best Star Cup time: 0:06:43.33 by Jeremy 'DK28' Doll on 2009-02-22. Best Special Cup time: 0:06:33.00 by Jeremy 'DK28' Doll on 2009-02-22. Best time: Single-segment 0:25:40.73 by Jeremy 'DK28' Doll on 2014-08-03. First off, thank you to the SDA crew for everything, including Nate for the video work and Mike for always being available. I know it seems we all say thank you in our game notes, but it's necessary. These guys provide a free service for our "habit" and deserve our gratitude with every run. This one was especially for you, Enhasa. And everybody else who loves this game as much as me. With SSB64 done, this is the second installment of "Collect the whole set". This time we're doing the Mario Kart series. There were two hard things about this run. First, on SMK, I've always used Toad, so learning a new character was a challenge. Toad gets his revenge by being the 1st place computer character chasing me during this run. But the worst thing, I had forgotten how unforgiving the starting boost was to pull off. I had many attempts ruined by botching the start on the fourth or fifth race. Once again, it's Donkey Kong FTW. Mario Circuit 1 - Perfect. My best time ever, with no assistance from mushrooms. Donut Plains 1 - First lap was perfect. I accidentally mow the lawn a bit on lap 2 and lose one second. The rest went great. Ghost Valley 1 - Perfect again, new best time with a couple of mushroom boosts. Bowser Castle 1 - First lap was perfect. The Thwomps at the start of lap two are down forcing a wide turn, I successfully thread between them, so I have to forfeit the first zipper, the second one is crucial as that is the one that carries your speed over the following jumps. I call garbage on lap five, I catch the side of the zipper, but it doesn't register so at the last turn I go for a quick time save by manually jumping the last lava pit for a quicker power slide to the finish. Mario Circuit 2 - My second jump doesn't go off after the boost, so instead of power sliding I eat some dirt in the beginning, I'm able to negate most of that with some recovery power sliding. The race continues to go great, until lap 4, I knick the edge of the oil pit even though I jump (So I don't get the zipper in the last race I clipped, but I do get the oil spill, curse you Mario Kart). Luckily, I'm able to mash out of it after only one spin to avoid the dead stop and I have the mushroom to take the ramp and more than make up the lost second, otherwise I would have reset. I take the last lap aggressively for the strong finish, including a near hit on Toad. Overall, a great start. I beat all of my average times, including two personal bests. On a funny note: My wife pulled one of the best jokes over on me. She was watching me play this night and right when I finished I dropped the control in victory and started to walk away. And then she says "Weren't you supposed to be recording?" I almost died until I saw it was recording. Well played honey, well played. Flower Cup 0:06:40.00 by Jeremy Doll. Choco Island 1 - One of my best times for this course. The key is to keep hopping off the bumps. The hard part is getting stupid green shells. As this course doesn't have a good spot to unload them. Ghost Valley 2 - Another personal best. This actually became one of my favorite courses to race, nothing but serious power sliding. Donut Plains 2 - I hate all the Donut Plains, let's just get that out there. I get lucky with the double mushroom. Consequently, I'm on my way to a record time and my finger slips off the R button on the last turn! The time is still good, but I could have started some bad collateral damage after that. Bowser Castle 2 - This proved to be a difficult course, many restarts spawned here. You have to watch out at the end as full speed will cause you to go lava swimming from over bouncing on the jumps, so I don't mind some wall collisions. Mario Circuit 3 - Very pleased here, it's always good when race 5 goes well. I almost make a mistake starting lap 2. I meant to lay the green shell down, letting it loose could have come back to haunt me, but it smacks Luigi in the face, problem solved. Another great cup. I think this one took the longest as it's the cup I did the least during casual play. I'm very happy with the results, one more personal record. Star Cup 0:06:43.33 by Jeremy Doll. Koopa Beach 1 - Okay, screw the bouncing fish. That's all I have to say. Choco Island 2 - Super feather for the win! My original strategy was to do a normal start, putting me in 4th or 5th place at the item pads to increase the chance of a feather. I ditched that as it chopped the time gained in half. So what you see here is another best time. Vanilla Lake 1 - This is the first of a few courses that can destroy your run, just because of the layout. It's basically a circle, with no real shortcuts or spots to get ahead. So, even if you're setting a world record time, the computer is always on you and will pass you at any mistake. So you need to just not screw up. Easy enough. Bowser Castle 3 - Best time ever for me here, by a long shot. Even with the Thwomp error. This race terrorized me pretty bad. But I nailed it this time. Overall, I'm still satisfied with this cup. I went back a few times to re-do and recover with the boost on Mario Circuit, but the feather on Choco Island combined with my record Bowser Castle time was still the faster time I could do. Still, I petition Mike to add "No family while running" to the FAQ page for new runners. Special Cup time: 0:06:33.00 by Jeremy Doll. Koopa beach 2 - Another one of those "circle races" like Vanilla Lake. And those stupid fish, I'm a Gorilla, can't I eat those too? I take out Toad, which usually causes the other CPUs to slow down so he can get back in the lead, but Bowser doesn't cooperate. Vanilla Lake 2 - The last "circle race", but this one is actually my favorite course. I was really hoping for a mushroom, oh well. I enjoy all of the water skipping. Rainbow Road - Absolutely brutal. Yes, I failed here many times. I was dying for a mushroom here, but to no avail. I've also had multiple runs killed on many courses by the CPU throwing an item right on top of me. When Yoshi tossed that egg, I thought that was it, close call. And, yes, I almost fell on lap 5. And, no, I don't want to talk about it. Great finish. I was so glad to put this one away. I am very happy with the run, I feel this is some of my strongest racing. Especially considering I just started using DK. The only area I wish could have gone better was better luck with the items, but that is out of my control. But in the end, I beat all of my average times, which was my personal requirement while running each cup. Single-segment 0:25:40.73 by Jeremy Doll.